A united front of Left student groups on Sunday won all four central panel posts in the JawaharlalNehruUniversity students’ union defeating the Rashtriya Swayamsevak Sangh-affiliated Akhil Bharatiya Vidyarthi Parishad by considerable margins in an election marred by allegations of “bias” by the poll committee, violence and suspension of counting for nearly 14 hours. Announcing the results of the keenly contested JNUSU election, the poll committee said N Sai Balaji was elected as president. Balaji of the All India Students’ Association bagged 2,161 votes. He defeated Akhil Bharatiya Vidyarthi Parishad candidate Lalit Pandey, who garnered 982 votes, by a margin of 1,179 votes. The Left-backed AISA, Students’ Federation of India, Democratic Students’ Federation and All India Students’ Federation came together to form the ‘United Left’ alliance. The ‘United Left’ candidate for the post of vice president, Sarika Chaudhary of the DSF, garnered 2,692 votes and trounced ABVP candidate Geetasri Boruah by a margin of 1,680 votes. Boruah secured 1,012 votes. Aejaz Ahmad Rather of the SFI polled 2,423 votes and won the post of general secretary, by defeating Ganesh Gurjar (1,123 votes) of the ABVP by 1,300 votes. Amutha Jayadeep of the AISF defeated ABVP’s Venkat Choubey by 800 votes to win the post of joint secretary. Amutha bagged 2,047 votes as against Choubey’s 1,247. Balaji is a student of JNU’s School of International Studies. Chaudhary, Rather and Amutha belong to the School of Social Sciences. A total of 1,148 votes were polled in none of the above for the central panel. Last year too, the Left student groups had won all four central panel posts. Besides the Left bloc and the ABVP, which is the student wing of the RSS, there were candidates of the Congress-affiliated National Students’ Union of India and the Birsa Ambedkar Phule Students Association, a student group advocating Dalit causes. Even before the results were announced, there was a festive atmosphere in the Left camp as their candidates were leading by considerable margins. Cries of ‘Lal Salaam’ (red salute) rent the air and supporters were dancing to the beats of drums. With their faces smeared with red ‘gulal’, the students raised slogans of ‘Justice for Rohith’ and ‘Justice for Najeeb’. Rohith Vemula, a student of Hyderabad Central University, committed suicide alleging harassment by the varsity administration in 2016. Najeeb Ahmed, a student of JNU, went missing from the campus under suspicious circumstances in 2016. He has since been untraceable. 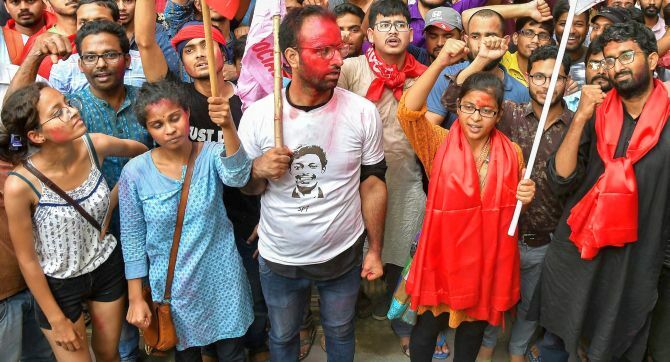 The RSS-affiliated ABVP and the Left groups indulged in a blame game on Saturday as they accused each other of roughing up their members on the campus. 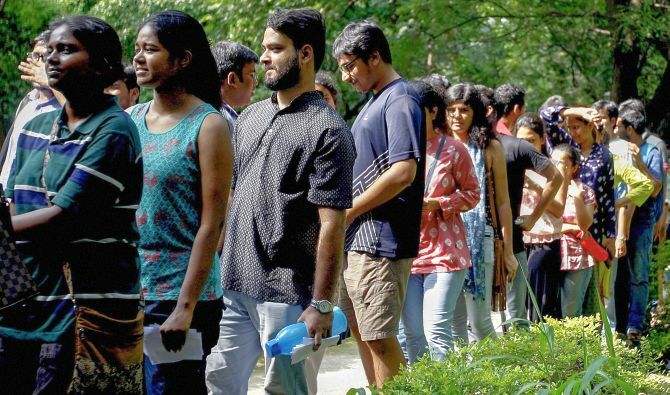 President of ABVP-JNU unit Vijay Kumar had alleged that counting of votes was being done without adhering to the rules and had said the biased way of handling elections put a question mark on the election committee’s neutrality. He claimed that their counting agents were not called by the Election Committee at the time of counting.